Although I didn’t much care for Tomas Alfredson’s Tinker Tailor Soldier Spy, I should begin by giving it its due. The movie does a fantastic job of conveying what Britain looked, sounded and even smelled like in 1973, which was the year I arrived there for what turned out to be a nearly 15-year stay spanning the transition from the Britain of the post-war era to the threshold of the post-Cool Britannia of today. The clothes, the cars, the general dinginess and shabbiness of everything is captured perfectly, so far as I can see, in spite of the odd false note like having George Smiley (Gary Oldman) and an associate dining in a Wimpy Bar. Obviously, the Wimpy Bar has to be there in order to give us the full flavor of the period, but men of their class wouldn’t have been caught dead in one. Movies these days are generally pretty good at re-creating the material past, but this one is a reminder of the importance of also getting the moral and intellectual and spiritual past right as well, for it cannot be understood apart from that cultural context. In its case, that means the John Le Carré novel of 1974 and the 1979 BBC television adaptation of it starring Alec Guinness as well as the history of the Cold War on which both purport to be a distinctive gloss. Unlike Mr. Alfredson’s previous film, Let the Right One In, which was a completely original take on the vampire legend, Tinker Tailor places itself squarely in the middle of the now well-established tradition of cultural customs and concepts with which it deals — partly, perhaps, in order to suggest a continuity between that tradition and current political realities with which it would otherwise seem to have little in common. In other words, now not only Cold War spies but spies in general are seen as inhabiting that famously "twilit" world invented by Mr. Le Carré to express his own conviction of moral ambiguity and, in consequence, a near moral equivalence between Communist slave states and what used to be called "the West." That this is an important preface to any discussion of Mr. Afredson’s movie is suggested by the unconsciously hilarious remark of Manohla Dargis, a reviewer for The New York Times, that "Tinker, Tailor is set against a geopolitical (and movie) moment that is almost quaintly, reassuringly old-fashioned, a time when enemy agents had names like Boris, and a red flag with a hammer and sickle made the ideological and political stakes clear." She is of course not alone in conveniently forgetting how very unclear the ideological and political stakes were to so many of her fellow lefties at the time, not excluding Mr. Le Carré himself. But he, at least, has always been admirably consistent in preferring moral muddle to clarity — except, that is, when it comes to his implacable anti-Americanism. Fortunately, the economics of the movie business and the need for the film to make enough cis-Atlantic money to repay its production costs require that there should be no more than hints of Mr. Le Carré’s views of the United States in this version of Tinker Tailor Soldier Spy. Anyway, I imagine he would agree with the editorialist for The Guardian who sees his hero not as reassuringly old-fashioned but rather as reassuringly British. "George Smiley is the sort of spy this country believes it ought to have," this person confidently insisted: "a bit shabby, academic, basically loyal, and sceptical of the enthusiasms of his political masters. Smiley would not, it is safe to say, have wanted to modify intelligence to encourage the Iraq war. He was never real, but we need his type still." Trust a leftie to prefer unreal intelligence officers! And what, exactly, is that adverbial modifier "basically" meant to convey about the loyalty of this paragon? Mr. Oldman’s George Smiley, like Mr. Le Carré’s, is apparently loyal tout court, even if at least one of his colleagues is not. Yet I think maybe The Guardian, Mr. Le Carré and Mr. Alfredson, a Swede, are all going for the same thing here, which is a sense that, for the post-imperial Briton with a proper sense of his own guilt about continuing to exist at all, loyalty always must be qualified because it carries with it the taint of patriotism. And patriotism in the left-wing view of history amounts to a retrogression to the "ethnocentrism" of empire. Enemies today’s Britisher may still have — even enemies that he still must fight against. Yet he must never, never allow himself to feel morally superior to them. I fancy it is because Americans are supposed to be lacking in such scrupulosity and accordingly suffer from way too much moral self-confidence that they strike the aristocratically-minded Mr. Le Carré as being so vulgar and distasteful. One supposes that this vital lesson cannot be taught us too many times, which would explain the otherwise baffling decision basically to remake the 1979 mini-series and have Mr. Oldman doing an impersonation not of George Smiley but of Alec Guiness playing George Smiley. Obviously, the key moment in the film comes when Smiley says to the Russian spymaster, Karla, "We’re not so very different, you and I. We both spend our lives looking for the weaknesses in each other’s systems, but there is as little worth on your side as there is on mine." In the context, this is supposed to be a ploy to help persuade Karla to betray his own side. As Smiley believes, the latter is about to be shot on his return to Russia anyway, so it shouldn’t take much to bring him over. But when Karla refuses to rise to the bait, Smiley says, "That’s when I knew he could be beaten. He was a fanatic, and the fanatic is always concealing a secret doubt." Of course the secret (and not so secret) doubts all turn out to be on the non-fanatical British side, which leaves Smiley’s ostensibly cynical expression of moral equivalence hanging in the air, the thing that everybody takes away from the movie because it sounds so like a proper movie profundity. "We’re not so very different, you and I." Oh, please! Here’s how different he is. Put those same words in the mouth of the Russian and watch the audience crack up. The very idea is ridiculous. That must be why Karla doesn’t actually appear in the movie except as a disembodied voice. In the mini-series, a mute and bearded Patrick Stewart played the part, but even he was a standing rebuke to the facile notion that he and Smiley had anything important in common. To be sure, the novel was more subtle about it, but it was an empty paradox even at the time. Now it’s a cliché, and one that Mr. Alfredson cannot avoid, so central is it to the character of Smiley and the whole Le Carré franchise. It sits inertly at the center of things in his movie and makes everything look as if it is taking place in slow motion. Especially Mr. Oldman’s part of everything. It’s as if he has to pause for a moment every time the camera turns to him in order to remind himself to look suitably lugubrious about his efforts on his country’s behalf, since all the weight of Britain’s decline is on his shoulders. Not that Mr. Alfredson and his screenwriters, Bridget O'Connor and Peter Straughan, have nothing new to add to the formula. It is perhaps only a matter of emphasis, but in keeping with more contemporary interests and concerns, they have supplied even more of a personal counterpart to the political by adding to the secrets his spies have evidently become so damaged by having to keep that of three "closeted" homosexuals, one of whom is the man eventually exposed as the traitor Smiley is in pursuit of. The gay element here is perhaps not without warrant in the novel — as in the history of the "Cambridge Spies" on which it was partly based — but cultural changes of the last 30 or 40 years have given a different meaning to it, and one which is bound to obscure or even negate the novel’s moral meaning. In the context of today’s sexual politics, that is, bringing these spies’ sexual orientation into the foreground tends to make the film’s central question of ultimate loyalties look more than ever like a matter of gay lovers’ jealousies, bred in the hot-house atmosphere of pre-war public schools and all-male Oxbridge colleges — nearly all of which have now got with the times. That orientation of the material, in turn, points us towards the paradoxically sexless and santized era of Stella Rimington and Eliza Manningham-Buller, who have become the public faces of MI5 in the more recent past, and a prominent graffito in the movie reading: "The Future is Female." So it has proven to be, too — not least in the fact that the intelligence service is now allowed to have a public face. In short, it all seems rather academic, this little trip down memory lane, now that that world along with the Cold War which seemed so important at the time have been swept and tidied away in the box called old-fashioned. Now, in the age of Wikileaks, we cannot but realize that state secrets themselves — like the old boys’ networks that used to keep them and the patriotic impulses once thought to be their justification — have become more or less discredited in the decades since John Le Carré wrote his Smiley novels. And we may also realize that this is a state of affairs to which those novels always looked forward with unseemly eagerness, rather as his traitor in Tinker Tailor does to the collapse of the "ugly," shabby, morally grubby Western world he despises. At the risk of sounding like a fanatic, I can’t find anything in my bosom that returns an echo to such world-weary and pessimistic self-satisfaction. 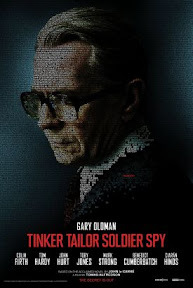 Tinker Tailor Soldier Spy. Director: Tomas Alfredson. Starring: Gary Oldman. Length: 92 mins.